New York Times bestselling author of THE GOOD GIRL, Mary Kubica is back with another exhilarating thriller as a widow's pursuit of the truth leads her to the darkest corners of the psyche. "The bad man, Daddy. The bad man is after us." Clara Solberg's world shatters when her husband and their four-year-old daughter are in a car crash, killing Nick while Maisie is remarkably unharmed. The crash is ruled an accident…until the coming days, when Maisie starts having night terrors that make Clara question what really happened on that fateful afternoon. Tormented by grief and her obsession that Nick's death was far more than just an accident, Clara is plunged into a desperate hunt for the truth. Who would have wanted Nick dead? And, more important, why? Clara will stop at nothing to find out—and the truth is only the beginning of this twisted tale of secrets and deceit. 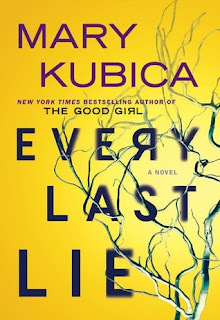 Told in the alternating perspectives of Clara's investigation and Nick's last months leading up to the crash, master of suspense Mary Kubica weaves her most chilling thriller to date—one that explores the dark recesses of a mind plagued by grief and shows that some secrets might be better left buried. Kubica made so many emotions run through my veins with her latest novel, Every Last Lie and I loved it! I've only read one of her other novels, but I knew the second I read the synopsis for Every Last Lie that I had to pick it up! It is very different than The Good Girl and it totally surprised me. There were way more twists than I was expecting (like, with every character!) and I was on the edge of my seat from start to finish. I absolutely loved Kubica's style and tone in Every Last Lie. She turned the simplest sentences into tense situations that left me hanging until the next chapter. I loved the constant thrill and suspense! I would highly recommend this book to readers who enjoy thrillers, although it is quite different than I expected. *Thank you to BookSparks and Park Row for sending this novel in exchange for an honest review.